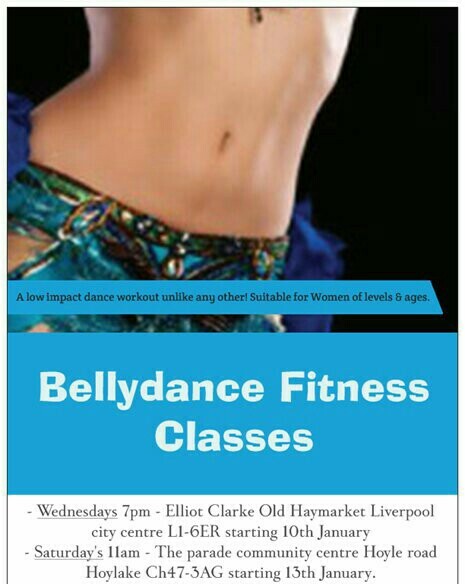 Wirral Belly Dance Class - EVERY WEEK! Saturdays 11am at the parade community centre hoyle road Ch47-3AG. Free car park Note this is a Women's group. People Of All Ages & dance / fitness abilities welcome. £5 JUST TURN UP! All levels! All Ages! All Welcome! £5 per class. Just turn up! Belly dancing for health and fitness incorporates authentic low impact safe beginner techniques and dance moves that include moderate cardio flexibility and resistance fused together for a fun upbeat dance class style workout. 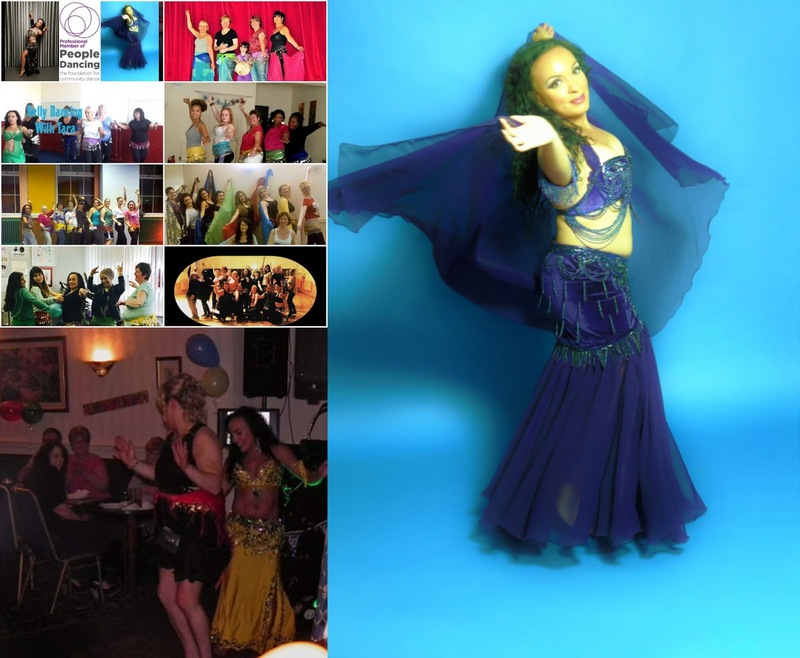 Oriental dance (also known as belly dance) covers a wide spectrum of belly dance styles that includes smooth and seamless Egyptian dance, Sassy and sharp Turkish dance, Relaxed Upbeat and Earthy fun North African dance along with some theatrical fusion. Giving a good overall dance exercise workout. Taught by a working professional belly dance performance artist who holds relevent dance and fitness certificates ensuring safe teaching. The classes run over ten consecutive weeks (10 week block / course) you are welcome to join upto week 3 or try a taster class within this time frame. As a professional dance artist I have been teaching successfully for the past 6 years(see timeline below) and am fully insured to teach. Class tuition is of a high standard with a down to earth instructor. I run other courses & workshops for those who want to learn more. You can check back at a later date to view course and workshop info or contact me via email. *Over 18s only unless 5+ & attending with Mum. Everyone is charged the same price! Refunds - no refunds on missed classes (come to another venue/ course within the same block to redeem outstanding classes. Learn more workshop - Cabaret Cane Technique, make your own cane. We attended many places of arts culture and education Performing & teaching. 2017 Class Course Lesson & Workshop Info!!! 2018 specialised bellydance fitness classes -bookings are preferred. For drop in contact me via email. All venues are clean and tidy with an area to change, use of toilets with kitchens with drinking water. All follow heath and safety procedures and are public registered venues with floors suitable and safe for dance. There are 10-12 spaces per venue and must be be booked for reserve on the course. Throughout the year there are many private belly dance social events and public community events myself and my dance class members are invited to as part of a group where you can socialise, Watch live entertainment or get involved in performing with the group if you want to (optional). Firstly you do not have to expose your tummy unless you want to.Wear whatever you feel comfortable to dance/exercise in. Most attendees usually wear gym wear or leggings/yoga pants with a fitted t-shirt/top. Some ladies wear special belly dance wear which can be purchased online while others opt for gypsy or maxi style skirts with cropped/belly top or bolero. The important thing is to make sure your clothing is comfortable and suitable to dance/exercise in and doesn't restrict you in anyway. Dancing barefoot is perfect for belly dancing however if you prefer to wear shoes you can buy inexpensive flat belly dance, ballet or jazz pumps that are soft and may have a suede sole. When dancing on carpeted areas bring socks. Belly dancing is a fun uplifting style of exercise that has lots of health and fitness benefits. Unlike some forms of high impact dance exercise, Belly dancing is low impact meaning its easy on the body and joints. It incorporates resistance muscle strengthening, Flexibility stretches, Toning and sculpting movements and not to forget great cardiovascular exercise from travelling steps and a wide range of shimmies. Teamed together with my unique creative lesson planning you will never get bored learning how to belly dance at my class. Belly dancing is beneficial for women because you don't have to conform to a particular body shape. Its okay just to be you. Belly dancing is both a social form of dance and can be taken up as a hobby or as a serious artistic performance profession. Belly dancing is great for those who are looking to try it out for the first time, Attend for the health and fitness benefits or to learn a culturally artistic and exotic skilled hobby. Call or email me to book your space. Come to the class on the start date. Pay with cash at the class or in advance by PayPal or Postal order. If you pay £5 taster class price in advance online or by postal order this acts as a deposit. Just come to the class on the start date and pay for the rest. No refunds. If you miss a class you are welcome to attend a class at another venue within the same course period. If I cancel a class you will be given a refund for classes left to be redeemed. I have a health problem, Can I still come to class? For more serious health problem, Before booking please have a word with your GP. If your GP says you are okay to attend then attend. For minor health problems you are responsible for your own well being. therefore if you don't feel well enough to take part then don't take part. I am not a medical professional therefore I am not qualified or insured to advise on medical conditions. When you come to class you will be asked to fill in a short student learner agreement that you should sign. This is in agreement that you want to take part in a class and you have followed the advice I have given in order to take part. You have a history of coronary problems. Can I Just Turn Up & Pay Weekly on a Drop in Basis? No. This is a course and is not available for drop in. Why Does The Course Need to Be Booked and Paid for in Advance? The sessions are part of a course. There are a set number of spaces and there is something to work towards. Each class is planned and tailored to the space and people that fill it. Some times people can be unreliable by not turning up once booked and not letting me know in advance. This can effect the flow of the course and it's not fair on the rest of the class who make an effort and are reliable. When you pay for something you are likely to make more of an effort with respect to the class. If you prefer drop in class please click the link at the top of the page to see if I am running any suitable and near you. I am a Member of Another Class, Can I attend Your Classes? Yes of course. The more classes you attend with many teachers the more you will learn. However do let your teacher know. *Don't turn up just to steal creative work, Be a nuisance or advertise your teachers services. It's unethical and lazy. I have banned one person for doing this therefore I have a no advertising policy at all my classes. If you have fell out with your teacher please don't come to class bad mouthing your teacher. It spreads negativity among the class. My class is a safe environment where everyone should feel relaxed. why not? Come see if you like it for yourself. Past and present students are rarely disappointed. If you like it, You like it. If you don't, You don't. Everyone is welcome to try a taster class at your own free will, Nothing more is expected from you other than to take part, Learn and enjoy yourself. go to the new classes page for members of the class.